In Diablo III, a good deal of high level play revolves around entering farming runs with random strangers and marching through content to try and get the most items and gear in the shortest amount of time. It’s fun, but it’s disappointing that it seems to exist in a cone of silence. You can easily enter public games with up to three other players in one of the world’s most popular games, and no one will talk. People join together to get loot, because Diablo III makes it more likely that you’ll get more loot if you’re battling the more difficult enemies that spawn when playing with others. But they don’t talk, because it seems that Blizzard just didn’t design this installment of Diablo to be social enough for strangers. You might join a group that is labeled as “Bounties” or “Rift. The label will tell you something about the group’s purpose, but once you get in there is essentially no communication between players. Nothing is said. No directions are given. No one asks for help or offers advice. Players just run around killing as many things as possible or completing quests on the map. Then they leave without a word. “The game is too fast paced at high level play to deal with the cumbersome in-game messaging,” one player said. But the lack of communication that comes from that makes public games useless to him. When you enter a public game, you aren’t really expected to do anything. In fact, I’ve been in several games where players simply went AFK for long stretches of time, with no real consequence. Most of the time, players rush to mercilessly mow down the hordes of hell and loot any items they need as fast as they can. If another player can’t keep up, they can straggle behind and pick up items, or go to different areas of the map or dungeon to carve their own path. Diablo’s endgame content comes in the form of “rifts.” A group of players can enter a “Nephalem Rift” if they want to farm items or a “Greater Rift” if they want to take part in a time trial. Leaderboard ranks are decided by the level of difficulty of a Greater Rift and how quickly you completed it. “If I’m playing a multiplayer game, I want to actually talk to someone” Diablo III player Nicholas Nold said when we chatted about this issue. He’s been playing the game since its beta. “The game is too fast paced at high level play to deal with the cumbersome in-game messaging,” he said. But the lack of communication that comes from that makes public games useless to him. He now outright avoids public games. So, why does anyone subject themselves to Diablo III’s cooperation-free public games? If it’s so awkward to try and communicate, why attempt to play in public games? The answer is: more loot. 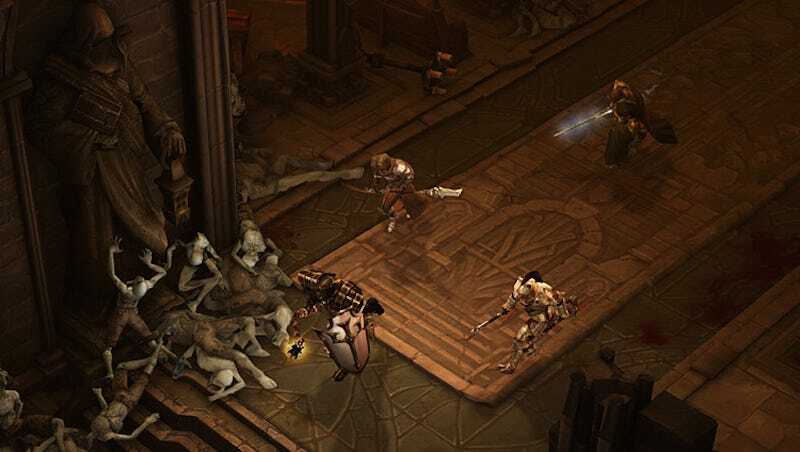 At its core, Diablo is a dungeon crawler. Players dig deeper and deeper into the abyss of hell with the hopes of finding better loot to enable them to dig even deeper. That’s the intended feedback loop: push a little harder this time so that you can push even harder the next time. However, unlike some other dungeon crawl games, killing harder enemies does not reward better loot, just more. If I traverse an unspeakable hellscape that tests the very limits of not only my character’s stats but also my own personal sanity, I’m going to find the same quality of loot as if I was simply stomping through the hordes of demons on a much easier difficulty. The harder enemies just have a better chance of dropping an item. The math is more in your favor if you team up with other players, because, in a multiplayer game, if a player kills an enemy, everyone in the group has a chance at an item. Additionally, while monsters grow more powerful when additional players enter a game, that increase is dwarfed by the inherent synergy of having multiple players fighting, weakening enemies and empowering other players. Those trying to acquire the most gear possible quickly learn that, despite its tedious and uncommunicative nature, public games still allow for the most loot with the smallest time investment. If you don’t have friends to play with, you need to play with strangers to take advantage of this math. And so you’re stuck playing games in which no one talks. Looper said that in the 200 hours he’s played Diablo III online in public sessions, he’s only had one conversation with other players. “It was great,” he said. He and the pair of players he was randomly grouped with chatted at length about what characters they like to play and what items they are currently hunting. The trio went on to clear several more dungeons together. That’s what you would expect from a casual encounter in any other online game. The experience stands out to him as one of his favorite moments with this franchise in recent memory. One player said that in the 200 hours he’s played Diablo III online in public sessions, he’s only had one conversation with other players. “It was great,” he said. To clarify Looper’s point on trading, while you cannot trade everything, you can drop items for other players only if they were in the game when you found it and less than two hours has passed. It is not uncommon to see a player teleport back to the main base and simply drop everything they had just looted, in case anyone else needed it. This is often less a showing of caring or friendliness but more due to limited inventory space and an abundance of materials that render inferior items nigh-useless to players who have farmed a great deal. However, it serves as another reason to farm in public games, as another player may simply toss away the item you have been struggling to find. Diablo III’s multiplayer experience can range from a slow, harrowing journey through endless torment and duress with your closest friends to a wordless, breathless mad dash to the finish line surrounded by complete strangers. It’s all a matter of what you want to prioritize: progression or the ability to progress. As of now, the status quo for grinding the best loot is to simply enter a public game and silently march through the minions of the damned, paying little regard to the player fighting next to you. Hellish indeed. Jonathan Ainley is a freelance writer based in Tulsa, Oklahoma. You can reach him on twitter @Jon_etc.